The thief will steal the gold from your purse, the food from your house, or the magic rope. Whatever he wants, he takes and he has decided to steal from the Caliph - until he sees the Princess. He loses his heart to her and disguises himself as Prince Ahmed - one of four royal suitors for her hand. When she picks him, he is overcome and confesses to his true nature which gets him flogged and thrown out of the palace. But he can yet win the Princess as all the suitors travel to find the rarest of treasures. 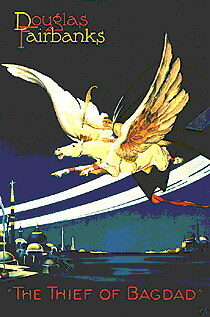 His trip is fraught with danger as he competes against the magic carpet brought by the Prince of Persia, the magic crystal stolen by the Prince of India and the magic apple taken by the Mongol Prince - who desires the Princess and the city of Bagdad. Lots of Fun With Douglas Fairbanks, an entertaining story, and all sorts of interesting sights, this classic is lots of fun to watch.The settings, costumes, and story put you convincingly into a fantasy world, and Fairbanks gets plenty of help both from these and from Anna May Wong and the rest of the supporting cast in making the characters come to life. 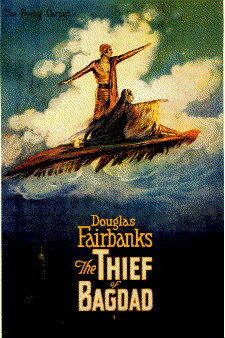 The first half is pleasant, although sometimes rather slow, as it sets up the rest of the story.Fairbanks has a perfect role for him as the good-natured thief who falls in love with a princess and then gets involved in a lot more adventure than he had planned on.His energy and believability, along with the interesting sets, carry the first part of the movie.The second half, when Fairbanks and his rivals are sent off on their quests, is full of adventure and fascinating detail.It's done with plenty of creativity and also many lavish special effects, most of which still work well.The excitement level is built up nicely in leading up to the action-packed finale. It's a movie that is both enjoyable and skillfully made.It would have to rank among the best adventure/fantasy stories made in the silent film era, and it's still as entertaining as just about anything of the kind being made today.